The sea is our planet’s last frontier: we know less about the ocean floor than we do the surface of the Moon. Like other frontiers – the Wild West comes to mind – it is riddled with lawlessness and opportunism. It also happens to be final resting place for countless wonders of the human past. As can be imagined, these things rarely mix well. Back on dry land, reams of legislation stand between the material heritage of our predecessors and its would-be exploiters. Countries like Turkey and Egypt have draconian regulations concerning the excavation, movement, and sale of artefacts. Such legal safeguards, even weak ones, are absent on the high seas. There is nothing to outlaw the destruction of marine sites, for example. Legislation concerned with excavation and preservation of marine sites is non-existent, and the matter of artefact ownership is a legal and political minefield. The matter is only exacerbated by the sea’s inherent lack of national association, its lack of law enforceability, and its vastness. There is a single piece of legislation that attempts to keep the wolf from the door, a UNESCO convention that declares underwater cultural heritage may not be sold off or exploited for commercial gain. In the latest episode of the marine archaeology debate, even this one law is being openly flouted. An 18th century incarnation of HMS Victory, a predecessor of Nelson’s celebrated ship, sank in the English Channel in 1744. The Ministry of Defence, charged with excavating the wreck, promptly delegated the responsibility to the Maritime Heritage Foundation (MHF) charity. They, in turn, outsourced the job to a commercial US salvage company, Odyssey Marine Exploration. This move has been met with heavy criticism from academics and the public alike. Their concerns are twofold. Firstly, can a commercial company, driven by the profit motive, be trusted to excavate with rigorous academic standards? Secondly, can their payment method – ‘a percentage of the recovered artefacts’ fair value’, or ‘artefacts in lieu of cash’ – be justified? Lord Renfrew, a prominent archaeologist and chairperson of All Party Parliamentary Archaeology Group (APPAG), has denounced these arrangements as being akin to ‘plundering’. After all, the MHF is essentially paying for the salvaging operation by selling off parts of the wreck itself, which does resemble the way looters do things, and, according Lord Renfrew, almost directly contravenes the above UNESCO directive. 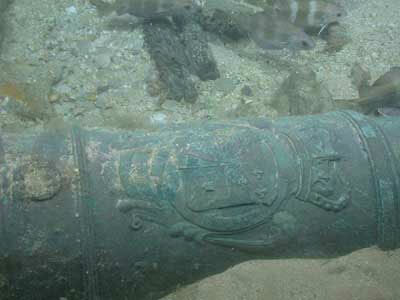 Amusingly, two of the bronze cannon already recovered have been sold to National Museum of the Royal Navy for £50,000…yet as it was the Royal Navy who built the ship, it could be argued they were buying their own property. As we can see, the commodification of marine heritage is problematic. If a land site was treated in the same way – outsourced to a commercial company who would then be paid either in artefacts or in the sale of those artefacts on the open market – there would be uproar. But given the unique situation marine sites find themselves in, is there any other choice but commercialisation? Underwater excavation is fantastically expensive and small trusts, such as the MHF, have but a fraction of the largesse necessary to undertake such projects. But, more importantly, there is a dire need to excavate underwater sites before they are destroyed. Many marine sites are in serious danger from trawlers. Fishing companies, in their hunger to harvest the world’s dwindling fish populations, practise a technique called ‘bottom trawling’. The effect of this is a ‘raking’ of the sea floor, leading to the destruction of marine sites on a daily basis, as well as having an adverse effect on aquatic life. To sit idly by and let these sites be destroyed would be a travesty. Many marine sites remain unknown, yet could possibly hold unimaginable troves of both artefacts and knowledge: how long will it be until the next Uluburun Shipwreck is accidentally razed? Due to the fiscal importance of the fishing industry, it seems unlikely any international legislation banning the practice will appear any time soon. So what can cash-strapped archaeology and heritage organisations do in the face of such large-scale destruction? Compared to inaction through lack of funds, carefully monitored commercialisation is a far lesser evil. The sale of some recovered artefacts may have to be tolerated as payment for the discovery, recording, and preservation of material that would otherwise have been destroyed. If that is too much for some to stomach, perhaps an alternative can be sought. As mentioned above, a central problem is that the location of many marine sites remains unknown. If a survey program was launched to discern the co-ordinates of potentially endangered sites, and international lawmaking bodies could be persuaded, trawling ‘no-go’ zones could be created – a kind of aquatic National Park or Heritage Site. Such a survey project would be costly, but no way near as expensive as actual excavation. This would leave time for rescue work to be conducted on a wreck-by-wreck basis, over many decades, whenever the funding arose. This, however, presumes the program’s proponents can successfully navigate the political labyrinth of international law and convince the authorities to enact these no-trawling zones. As we can see, marine heritage is currently in a difficult situation with no discernible ‘right’ answer. If nothing is done, the large-scale destruction of many marine sites is a certainty. The academic discovery, surveying, and recording of a good proportion of them, let alone all, is totally unfeasible. Commercialisation, while being able to process more sites, is ethically and academically contentious. Yet if nothing is done, we risk losing these maritime wonders forever.